DVD Ripper platinum, rip movie DVD to AVI. 3herosoft DVD Ripper Platinum is easy to use and professional DVD Ripping software. The DVD Ripper Platinum can easily rip DVD movie to almost all popular videos such as WMV, 3GP, AVI, MPEG4, MKV, RM, DivX, MOV, XviD, FLV, and SWF, and extract audio from DVD movie to AC3, M4A, MP3, WMA, WAV, and AAC, etc. with excellent quality and super fast Ripping speed! 3herosoft DVD Ripper Platinum is the powerful DVD Ripper software that supports almost all portable devices and video and audio players, such as iPod, Zune, iPhone, Apple TV, PSP, Xbox 360, PS3, MP4/MP3 Player, Smart Phone, Pocket PC, PDA, Mobile Phone, Archos, Archos AV500, Archos AV700, Archos GMini402, iRiver PMP-100, Creative Zen Vision and so on. 3herosoft DVD Ripper Platinum can perfectly rip DVD movie with no loss of image and sound quality. Significantly, it provides some useful settings to satisfy your needs, such as customizing file size, showing or hiding the DVD chapters, trimming video, select subtitle and audio track, setting video and audio parameters to specially fulfill DVD ripping and converting for your colorful entertainment life. Rip DVD movie to AVI, MPEG-1, MPEG-2, MPEG-4, WMV, DivX, MP4, H.264/MPEG-4 AVC, RM, MOV, M4V, XviD, 3GP, VOB, FLV, and SWF video formats. and extract audio from DVD to MP3, WMA, WAV, RA, M4A, AAC, AC3, and OGG audio formats. Choose from plenty of output profiles targeted for diverse multimedia devices, such as iPod, iPhone, Apple TV, PSP, PS3 and Mobile Phone. Rip any clips of DVD movie by specifying the start time and duration of the segment. 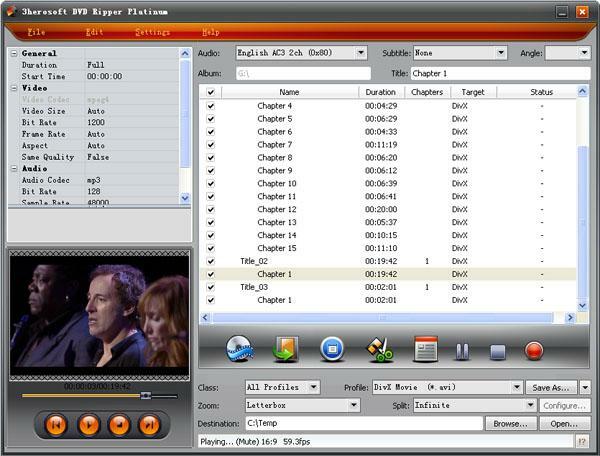 Auto split a large DVD title/chapter into several smaller video files to fit for all popular multimedia devices. Once inserting DVD disc, the software will auto retrieve DVD info from Internet like director, film name, DVD cover, DVD chapters and titles and more. Multithreading and batch conversion provide super fast conversion speed due to multi-core CPU support. Faster than any other DVD Ripper software. User-friendly interface without any complicated settings. Rip DVD movie with just a few clicks.